The Choir sings at Sunday Vigil/morning Mass. Choir practice takes place on a Friday at 7:30pm in Our Lady & St. Illtyd. Contact Moira Robinson / Richard Browning. 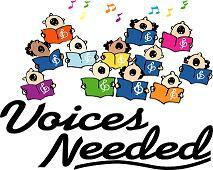 New voices are warmly invited to join our existing members in praising God through song.